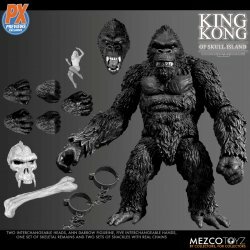 MyMovieMonsters.com > Action Figures And Busts > Mezco Toyz > Mezco Toyz King Kong of Skull Island Action Figure Set - PX Exclusive - JUST IN! Brace yourselves, city-dwellers! 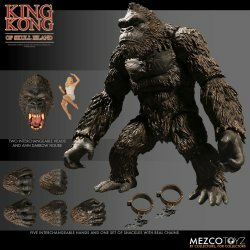 This is Mezco's PREVIEWS Exclusive Black & White King Kong of Skull Island action figure -- reminiscent of the 1933 classic film. Includes more accessories! Collectors Note: Brand-new and factory sealed Previews Exclusive B&W Version in very limited quantities. Picked directly from the manufacturer's shipping carton. Figure and accessories come packaged in a collector-friendly window box, perfect for display. We also offer the full-color version as seen in the 2017 film. Want both? Use the convenient Buy Both button below!